With the hubby out of action due to surgery I have been extra busy. Kids finish school next week - haven't even thought about pressies for the teachers that I can make in next to no time for next to no money, any suggestions? Christmas preparations are coming along decidedly slowly for me, I'm normally finished my shopping with gifts wrapped under the tree by now, but will need to spend all weekend at shopping centres I fear, and put hubby to use wrapping next week. Friends for dinner tomorrow, haven't cleaned the house yet, washing piling up since we've had so many storms lately and cupboards are bare. 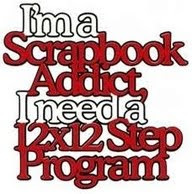 Classes at Fat Cat Scrappin' should clear my mind tonight and tomorrow afternoon, nothing like a little "me time" sans family to get me back on track and in the right frame of mind to deal with the day to day!